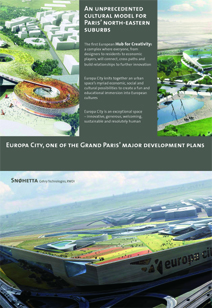 MIPIM, the leading international real estate event, was about to open its doors in March 2012 when Lord Culture asked me to translate Europa City‘s brochure that communication agency Acte II had prepared in French. Lord Culture is responsible for defining this major programme’s cultural strategy and developing and managing partnerships for real estate developer Immochan. The marketing brochure had to captivate Anglo-Saxon real estate professionals who were going to discover this major development project for the first time. A rush job, 48 hours turnaround, checking galleys included!